Each year as spring approaches, most women start thinking about summer and those long days at the beach, and preparing to look good in those bathing suits and bikinis. While many women decide to shed a few pounds, others begin looking for the best bikini razor so that they can wear those bikini bottoms with utmost confidence. Most people think of the Noxzema brand as a facial cream that gently cleans the skin and removes make-up while being safe for easily irritated skin. However, there are also a couple of disposable razors made under this brand name, of which the Bikini Plus Shower Trim Disposable Razor is one. The Noxzema Bikini Plus Shower Trim Disposable Razor is a reasonably priced and more durable looking razor than most disposables. It is also somewhat smaller than other razors as well. There seems to be two different styles of this razor made, and it appears, judging from the reviews, that some customers got the older style which they love, and others got the newer style which they don’t like quite as much. Reviews for this Bikini Plus Razor are good, with many women, and even a few men, finding that this razor meets their needs for an excellent price. While a couple of customers did not feel the blade was quite sharp enough and that it wore out too quickly, the majority of customers found that it did the job they wanted it to. 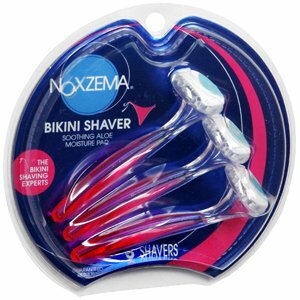 Another of the Noxzema razors is the Noxzema Premium Blades Disposable Shaver For Women. Designed for shaving that sensitive bikini area, these razors come in a pack of 18 for an extremely good price. Since these razors are difficult to find in most stores, buying them in sets of 18 will ensure you have plenty on hand. Several customers talked about using the Noxzema Premium Blades Disposable Shaver For Women for years, and then being disappointed when they no longer could find them in stores. In 1901, a man by the name of King Gillette invented a safety razor for men that quickly became extremely popular. However, it took another hundred years before this company produced a razor that was especially designed for women. The Gillette Venus Bikini Kit features the razor the Gillette Venus, as well a soothing lotion to use after you have completed shaving. While the price may seem a bit stiff for a disposable razor, you need to remember that you get the shaver, a bikini trimmer, and some hydrating lotion for your money. Reviews for the Gillette Venus Bikini Kit are very good with most people enjoying this kit. However, it should be noted that some customers don’t use the lotion due to the fact that it contains parabens and they wish that the razor and trimmer were sold without the added lotion. Another of the Gillette razors for women is the Gillette Daisy Comfort Hold Pivot Disposable Razor. This is a nice size package of razors that can really save you money. The pink color definitely lets everyone in the household know that this is a woman’s razor. Reviews for the Gillette Daisy Disposable Women’s Razor Package is extremely good with most customers finding these razors a great bargain. Many of the customers stated that they have used this brand of disposable razors for years. In 1921, Colonel Schick invented the repeating razor which allow men to change their razor blades without actually handling the sharp blades. This put the Schick company on the map. This razor was to become the forerunner of what is now known as the popular ejector razor. Today the Schick company makes a variety of razors, including the Schick Quattro Razor For Women. This is a nice alternative to those disposable razors for women. It is deemed a hi-tech razor that is built with women in mind and it has a feminine look. Overall, reviews for the Schick Quattro Razor For Women are good. Some women feel that this razor does not give them a close enough shave, and a few complained that this razor breaks easily if it happens to get dropped. However overall, most customers like the experience this razor gives them shaving. Another non disposable razor Schick has made just for women is the Schick Intuition Plus Shaving Kit For Sensitive Skin. The cartridges in this razor are great for women who hate those messy lathers, as the lather comes right in the blade cartridge with built in moisturizer. Reviews for the Schick Intuition Plus Shaving Kit are quite good with most customers really liking the convenience of this razor. Some customers do feel that the shaving lotion/lather gets used up before the cartridge gets dull. But overall, the majority of customers were happy with the performance of this bikini razor and found it was perfect for their needs. The last of the Schick razors included in this review is the Schick Quattro For Women Disposable Razor With Raspberry Rain Scented Handle. This Set Of 9 Disposable Razors sell for an extremely reasonable price and they are perfect for women who want to keep their bikini line shaved during those summer months. Reviews for the Schick Quattro Disposable Razor are extremely good with most customers really feeling this razor does a good job of meeting all their shaving needs. Having the best bikini razor on hand before the warm days of summer will help to ensure that you are ready for those long lazy and fun filled days at the beach. The right razor will do a great job thus allowing you to wear that bikini with total confidence.